From standing waves to blue-water wind chop, there's one universal truth: Watercraft decks get wet. Hence, the award-winning Great Divider and new Sub Divider. 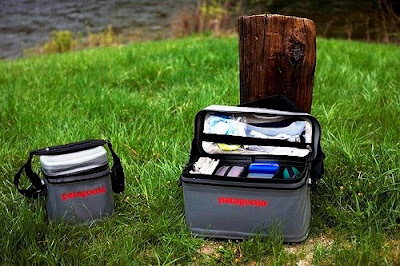 These soft-sided gear cases efficiently organize and protect everything a waterman needs. T hey are built from 840-denier nylon with a polyurethane coating on both sides and patented molded top and bottom "pans" for waterproof protection even in standing water (up to the #10 reverse coated zipper). Welded seams eliminate leakage. Shock-absorbing high-density foam gives these gear cases structure and can be removed for cleaning or to create an occasional cooler. Inside, foam dividers can be arranged in multiple configurations. Transparent pocketing makes locating things easy plus the end pockets are removable and are excellent for organizing small items. Access through the highly water-resistant zipper is aided by a new t-grip plus we've eased the corner radii for a little smoother zipper action. The Dividers are now more streamlined than ever with a single, widely adjustable, removable handle/split shoulder strap. Both the Dividers make great air travel carry on bags for sensitive equipment. Note that the time tested Great Divider fits into the base of the Freightliner Max as well as the newer Freewheeler Max. You'll find the Guidewater Duffle collection to be Divider-friendly too. I have both of these and they both have become critical pieces of my gear. I own the Frewheeler Max (roller bag) and I currently packing for my trip to Patagonia. I have found a system that allows me to pack my tackle in the Divider and it sits sideways in the roller bag. The Sub has become tote and I have used it for everything including holding my underwater camera. It sits towards one end of the roller bag, and leaves me plenty of room for my cloths. I have been pounding both of them hard and they seem to be getting better with use. Hi El Pascador.looks like another nice piece of kit from Patagonia. Just looking at the pics, Scott rods in the duffel you can't be all bad!! Thanks for the comments TP. With travel restrictions as they are, it's nice when your fishing bags can work with you and not against you. Maineflycastings, all I can say about money spent on fishing is that it's money spent on fishing. No worries about posting as anonymous Graham. It's nice to know that you are a Scott rod fan and that I "can't be all bad". Nice looking gear. What's that old line... my worst fear is that when i die my wife sells my fishing gear for what I told her I paid for it. I finally got a look at the new Divider bags. The new zipper pulls are a great addition, and removing the side straps was nice as well (mine were always sopping wet anyway). Nice touches on an already great product. I'm not a huge fan of the new color (seems like it'd get awful hot in there sitting on a boat deck in the sun) and I try to avoid "loud" branding on my fishing gear to attract as little attention as possible when traveling. Feedback appreciated Matt. I'm glad you like the new Divider lines. The materials and construction are time tested. When we approached the redesign we didn't really want to fix something that wasn't broke but we knew there were a couple of areas where we could make improvements. In typical Patagonia design methodology we said, how can we do more with less...and we did. Noted on your color comment. Our team was mindful of not just heat and found Feather Grey to perform well under all fishing and surfing conditions. Feather Grey is a color that a larger Stormfront collection will be moving toward so there are efficiency and cohesive forces at work too. We are sticking with Feather Grey for at least the near future. Regarding "loud" logos, it's a constant debate and it's always love or hate. For those of you out there that like the Desert Clay logo, get your Dividers this year. For those that don't, wait until next year when our Dividers have tonal logos to match the Stormfront series (stay tuned) and Guidewater Duffels. Matt, you might want to put duct tape over the logos regardless of color. The banditos know a good product when they see who made it. Noted on the duct tape - I leave for Costa Rica in the morning, and my Stormfront is already sporting a strategically placed stripe of it. It'll be interesting to see how the grey Stormfront does in the tropical sun. I'll report back in a couple of weeks. The current Stormfront Pack color is Nickel (darker than Feather Grey) just for accuracy's sake. Have a good trip Matt. Say hi to Capt. Dave for me if you see him. Matt. Glad to hear you'll have the divider along. It'll serve you well. Just make sure to remove the duct tape for a photo or two. Safe travels & howdy to Capt Dave. I hemmed and hawed about the Stormfront pack. Had one on order thru mail order. Cancelled. Guilt. So much money. Lost the inner fight. Plunked my money down. Happy camper. Bottom of my little Native Ultimate, with me paddling, can get kind of wet. Not anything in the Stormfront does though. Now you tempt us with a hint of things to come. New additions to the Stormfront line. Please tell me I can put off my search for a new hip pack. The Stormfront Pack is tempting Anon. and yes, I did hint at a collection coming. The good news is that it will include a hip pack. The reality is that you'll still have to make the same careful consideration about buying it because fabric, welded construction and waterproof zippers cost more than conventional options. Not only good for fishing. These two bags became my primary camera bags. I don't need to worry about water mixing with my camera gear and the bags keep items in good form. Excellent point Rene, the Dividers shouldn't be confined to just fishing pursuits. They provide durable, padded protection for a variety endeavors.....especially watery ones. I'm back from Costa Rica, and happy to report that both the Divider and the Stormfront were great. My camera gear spent all week in one or the other of these bags, banging around in the bottoms of various leaky boats and baking in the tropical sun. Both bags got hot enough that I wouldn't leave batteries or anything combustible in the top pocket of the divider or against the skin of the Stormfront, but everything in the inner padded compartments of bags stayed comfortably cool. EP, I'll send along some photos from the trip shortly. Follow up appreciated Matt. I'm glad the gear met your trip demands. Share pix when convenient. Welcome home. All I can say about money spent on fishing is that it's money well spent.